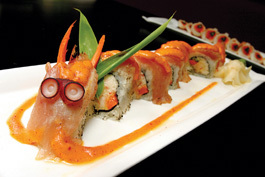 Feel the Burn: The Fire Dragon roll has a badass name, but really, it's kind of cute. FUSION cuisine is a bit like performance art. There are no rules. That's both liberating and hazardous. It can be creatively delicious or a train wreck of clashing flavors. Drawing from diverse ingredients and culinary traditions, a chef is free to invent new culinary creations. It's up to diners to decide if the chef's creations add up to art. Sunnyvale's 2-month-old Kampai House bills itself as Japanese fusion cuisine. Chef Suzuki Jin touts his 20 years of experience with what he calls "Fraponese" cuisine, the fusion of French and Japanese cuisine. Before opening Kampai House, he worked at the Four Seasons Hotel in Montreal, owned a sushi bar in Detroit and was executive head chef for Northwest Airlines' U.S. to Asia flights. Fusing Japanese and French food comes naturally to Jin. He moved from Japan to Montreal when he was a teenager and learned to speak French as his second language. His father is Asian and grew up in Paris. He started cooking in a top Montreal sushi bar, and because he spoke French and was skilled in Japanese cooking, began working for the Four Seasons Hotel. When Kampai owner Ken Wang hired Jin, he was cooking in a kaiseki-style restaurant near Osaka, Japan. Japanese-French fusion is not new, though Kampai puts a new spin on it. Meals at Kampai (which means "cheers" in Japanese) begin with an amuse bouche, a free little appetizer to get your stomach ready for what's to come. On my visits it was a long rectangular plate with peanut sauce-drizzled asparagus, soybeans and tamago (Japanese omelette). Deciding what to order at Kampai is difficult because of the large, somewhat confusing menu. The menu is divided into several categories: teasers, starters, entrees, nouveau sashimi, sashimi, shooters and house rolls. There's also a separate list of more traditional sushi items, salads and desserts. The teasers and starters should be condensed into one list. They cost about the same and aren't that different from each other. In general, prices at Kampai are pretty high (sashimi items range from $15 to $20) but portions are generous. One of my favorite rolls is Buddha's Belly ($15), a colorful combination of tuna belly, shallots, alfalfa sprouts and garlic chips. I'll eat anything with tuna belly, and this was a good showcase for the buttery rich fish. I'm also a fan of octopus, but was disappointed with the Opus Octopus roll ($10). The rice-on-the-outside roll packed crisped octopus, tiny kaiware sprouts, jalapeño, Thai basil and a rather mild chile sauce. In spite of all that, the thick rice overshadowed the octopus and other ingredients. Kampai's sashimi offers some of the most avant-garde creations. Yellow Mellow ($18) pairs hamachi (yellowtail tuna) with kiwi and lemon in a scallion and miso sauce. Bream Dream ($18) couples sea bream with yuzu chips, chives, Maui onion and an apple vinaigrette. One of my favorites was Whitey Tighty ($20) (yes, the names of the some of these dishes can get a little too cute). The dish places slices of white escolar tuna atop juicy cubes of watermelon and tops each with a tiny piece of asparagus anointed with a lemon and lime wasabi sauce. It's a delicious, refreshing combination. From the list of teasers, I liked Blue ($11), hamachi wrapped with a long, thin slice of cucumber that's drizzled with a sweet ginger vinaigrette. Kampai's entrees are good, but not quite as inventive as the smaller plates. Many have a salty-sweet sameness to them. My favorites were the Kyoto Emerald ($30), luscious, portobello mushroom-topped black cod marinated in sake and miso and then grilled, and Dynasty ($30), tender slices of duck breast sautéed with an oyster and shiitake mushroom infusion. The Dijon-miso dipping sauce on the side was great. Each entree comes with a creamy mound of sweet potatoes, an asparagus-stuffed cabbage roll and mushroom-filled musubi, a triangular rice ball. Desserts are the weak link at Kampai and are decidedly more Western than Eastern, perhaps a concession to American tastes for whipped cream and chocolate. Sweet Signorina ($10) is espresso tiramisu with coffee mascarpone and chocolate truffles, a big, rich dessert that would be at home in an upscale Italian bistro. Less successful is the Mango Matrix ($9), mango pudding that tasted more like coarse-grained Jell-O. One other gripe: Kampai has a good sake list, but servers aren't able to answer questions about it. Either train the staff on the sake list or include descriptions on the menu. But the staff makes up for this with their enthusiasm for chef Jin's cooking. And in spite of a few missteps, there's plenty to be enthusiastic about at Kampai. Address: 595 E. El Camino Real, Sunnyvale. Hours: 11am-10pm Sun-Thu and 11am-midnight Fri-Sat.